Peel the mangos and detach the fruit pulp. Finely dice half of the fruit. Puree the other half together with the oat drink nature, ginger, turmeric, cinnamon and a pinch of salt in the blender. Then stir together the oatmeal with the diced mango and the flaxseed and add to the oat drink/fruit puree. Mix everything together thoroughly, sweeten to taste with a little coconut blossom syrup, place it in the refrigerator for at least one hour, or even better, overnight. To serve, pour the mixture into glasses or bowls and garnish with the chopped pistachios on top. 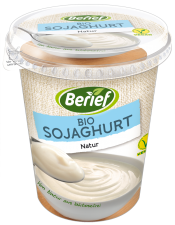 Those who like it even creamier can add a little soyogurt classic nature to the mixture before serving.